The project runs from Spring 2012 to Fall 2013. During the Summer of 2012, project team members and University of Florida educators will contribute lessons on coastal changes and community planning at the City of Cedar Key’s Summer Youth Program. In the Fall of 2012 the public and interested community groups will be presented information on coastal change impacts to Levy County and provide input to project members. Project members and the public will work together with this information in Spring of 2013 to develop future scenarios and visions in response to potential coastal change. A regional workshop will be held in the Summer of 2013 to showcase lesson’s learned from the the project. The final outcome will be presented in Fall of 2013 to the public and local leaders, which will provide a toolbox for planning in rural coastal communities with an emphasis on planning to plan for future coastal change. Partnership between the University of Florida research team, local leaders, and interested community members will help to identify current and future Big Bend assets and concerns. Areas of concern will be geospatially modeled to determine potential coastal change impacts. The impact analyses will receive input from local decision makers, businesses, and citizens. Additional civic engagement will come from youth, artists, and community events such as festivals and public workshops. Finally, a custom toolbox will be created to guide the community in adaptation strategies and encourage continued planning for coastal change. Coastal dynamics is the geomorphological change across a spectrum of coastal types including beaches and river deltas. Shorelines are continually changing due to natural and human causes. Change can occur from transport of beach sediment, silt accretion, sea level rise, and flooding. Catastrophic events such as tsunamis, hurricanes and storm surges accelerate beach erosion, potentially carrying away the entire sand loads. Is there evidence of accelerating sea level rise in the Big Bend region? Tide stations of the National Water Level Observation Network operating on all U.S. coasts, have been measuring sea level rise for over 150 years. Changes in Mean Sea Level (MSL), either a sea level rise or sea level fall, have been computed at 128 long-term water level stations using a minimum span of 30 years of observations at each location. These measurements have been averaged by month to remove the effect of higher frequency phenomena in order to compute an accurate linear sea level trend. The trend analysis has also been extended to a network of global tide stations. 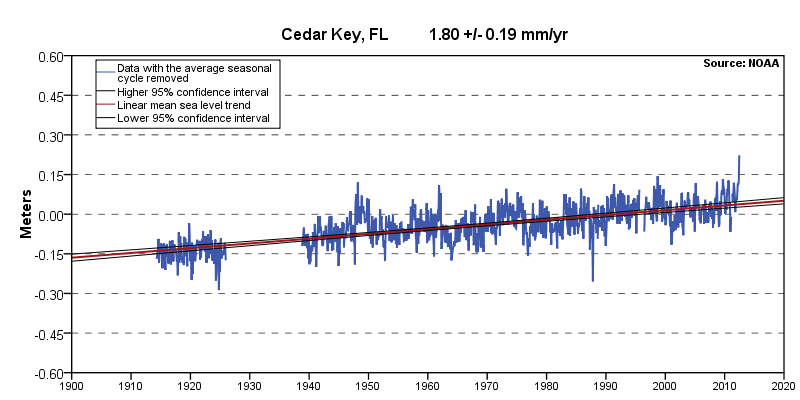 The measurements detailed below show that sea level is rising in Cedar Key, FL. 1914 to 2006 which is equivalent to a change of 0.59 feet in 100 years. Why should we plan for future coastal change? Some of the first observed impacts of coastal change may be flooding during storms and high tides, greater salinity in coastal aquifers, and changes in shoreline marshes and forests. Scientists have already documented the retreat of coastal forests for over thirty years in the marshes of Levy County. Scientists attribute the retreat to chronic stresses from increases in sea level and periodic intense storm events and droughts. The economies of coastal communities in the Big Bend are tied to numerous natural resources and natural amenities that may be impacted by future coastal change. Communities need to understand the issues that may develop with changing coastal dynamics and understand how to plan according so that people and ecosystems can adequately adapt. 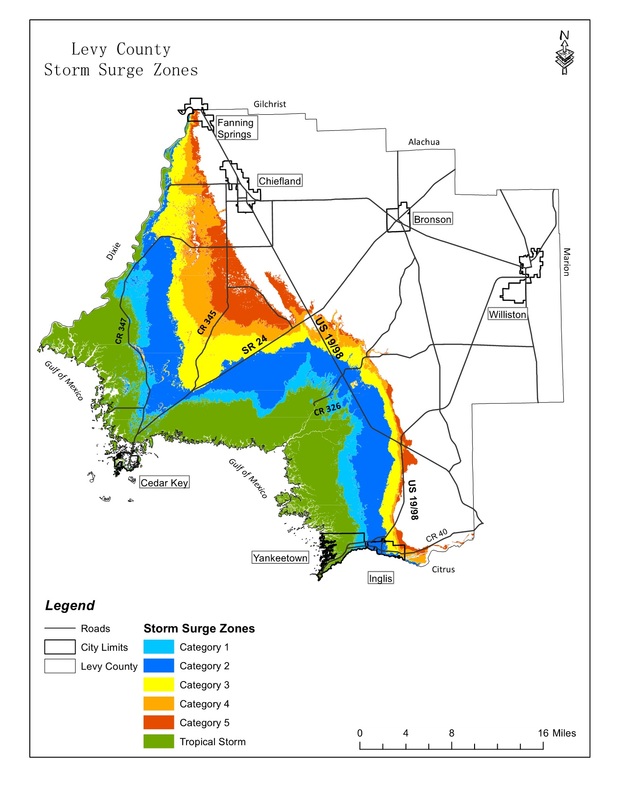 Hurricane storm surge zones extend far inland in Levy County. This means coastal areas are highly sensitive to changes in sea level and are vulnerable to flooding and frequent inundation. Communities need to plan accordingly for these major impacts to preserve economic investments and natural resources. Why plan for rural areas? Rural areas and communities are often overlooked, or are not actively engaged in the conversation, when planning for coastal change in Florida. However, rural areas, such as Levy County, have important social, cultural, economic, and ecological assets that are worthy of proactive planning for coastal change. Rural areas are an apparent nexus for interactions between social and ecological systems because of the connection between people and natural environment. The National Oceanic and Atmospheric Administration (NOAA) Sea Level Rise Viewer is an online bathtub inundation mapping tool that anyone can use to see how sea level rise at increments of 1 feet will affect their coastline. As an example, the image below was generated from the NOAA Sea Level Rise Viewer for 3 feet of sea level rise in Cedar Key, Florida.